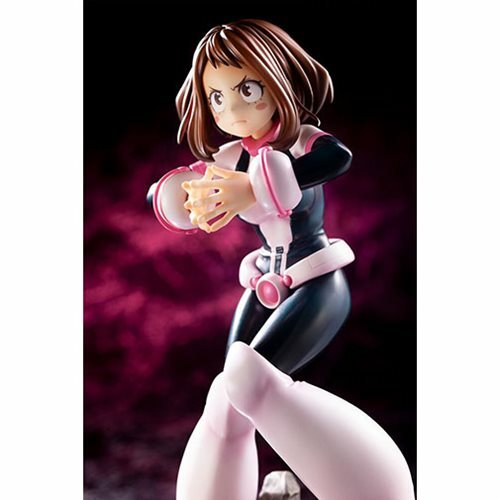 The latest character from the hit anime My Hero Academia to join Kotobukiya's ARTFX J line is Ochaco Uraraka! The ARTFX J line strives to bring characters from popular anime old and new to their fans throughout the world. This series of 1:8 scale statues brings to life the aspiring heroes of My Hero Academia at their best, in the moments when they face off against a "villain." Ochaco's sculpting and posing show off her "Zero Gravity" Quirk, with playful, buoyant detail. 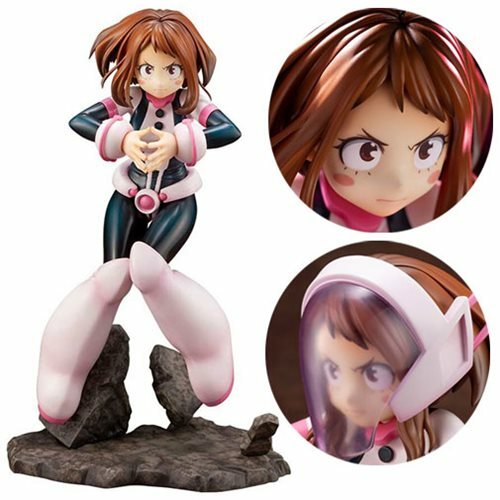 The My Hero Academia Ochaco Uraraka ARTFX J Statue also includes interchangeable parts to display her with and without her helmet. Display Ochaco alongside her classmates, My Hero Academia Izuku Midoriya ARTFX J Statue, My Hero Academia Shoto Todoroki ARTFX J Statue, and My Hero Academia Katsuki Bakugo ARTFX J Statue (sold separately) and recreate the world of My Hero Academia. Measures roughly 8-inches tall.